Everyone knows that Spain is a dream destination for foodies, but not everyone realises just how varied the cuisine is from region to region. The good news is that if you’re planning a trip to Barcelona – the capital city of the Catalan community – there are all sorts of local must-eat foods to delve into, many of which date back to hundreds if not thousands of years. 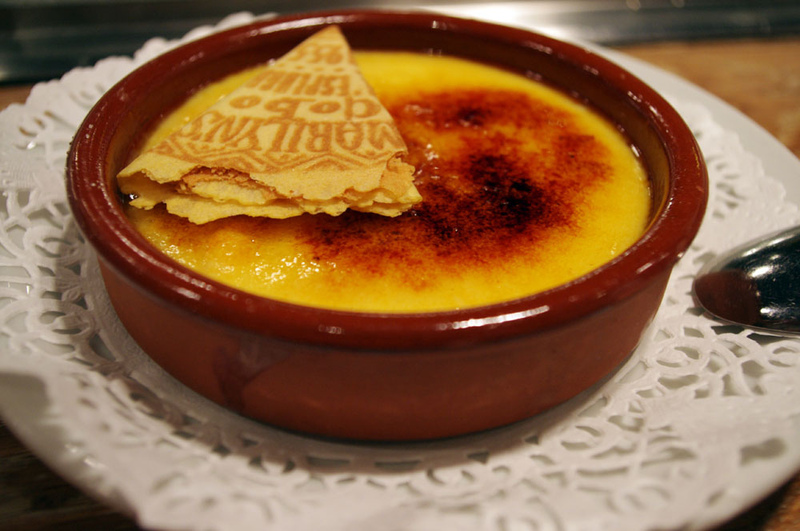 Here are a few dishes that you simply can’t miss during your time in Barcelona. No foodie trip to Spain would be complete without a paella feast! 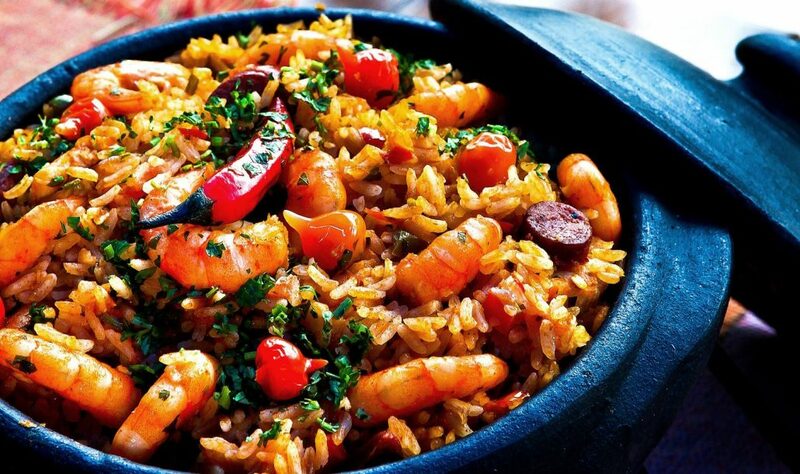 This iconic rice and seafood dish actually originates from Valencia and was originally made with beans and meat instead of fish a shellfish. Today, in every corner of Spain, paella is reserved for important celebrations and family occasions. Where to eat it: There’s absolutely no question the best paella is always homemade paella. It takes a very long time to cook, so it’s difficult for restaurants to make fresh. Only 5 minutes walk from Gaudí’s iconic landmark Park Güell, talented home-chefs Bego and Iván offers Barcelona’s best paella in town using a traditional recipe from Alacant. During the dark days of the Spanish Civil War, Barcelona was fraught with danger. Anarchists and revolutionaries roamed the then slummy streets of Barceloneta (now the city’s glitzy seafront neighbourhood), hurling handmade grenades in their fight against General Franco’s Fascists. These tiny grenades turned out to be extremely effective, and inspired a local (and highly imaginative) chef to create what is now one of Barcelona’s most iconic tapas dishes, “la bomba” (or the bomb). 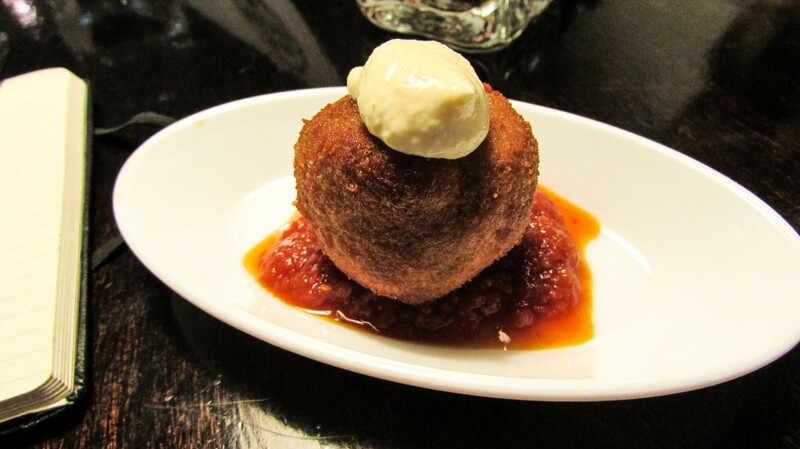 It’s basically a tennis ball-sized potato croquette served with two different sauces: a white garlic allioli that represents the string fuse that the anarchists would light before launching their grenades, and a rich and spicy red sauce that represents the bombs’ explosive qualities. Not only are bombas delicious, but they are quite literally an edible piece of Catalan history, a must for all foodies in Barcelona! Where to eat it: There are lots of good places to eat “bombas” in Barcelona, but it’s rumoured that they were invented at La Cova Fumada, a crumbling old hole-in-the wall type of place in the heart of Barceloneta. HIGHLIGHT: In case you’re interested in learning to cook a complete Barcelona meal, you should check out home-chef Núria’s widely popular Half-day Catalan Home Cooking Classes. Her classes take place at her home in the heart of Barcelona and she offers 3 classes, each with a different theme. Each class consists of a main dish, 2 fresh market tapas, and a dessert. The calçot is a type of green onion that is native to the region of Catalonia. They come into season at the end of winter and the locals celebrate their arrival with wild street barbecues. These sweet onions (and all sorts of meats) are grilled to enjoy with homemade romesco sauce, a traditional Catalan salsa made with hazelnuts, almonds, and red peppers. It really is the ultimate foodie fiesta! 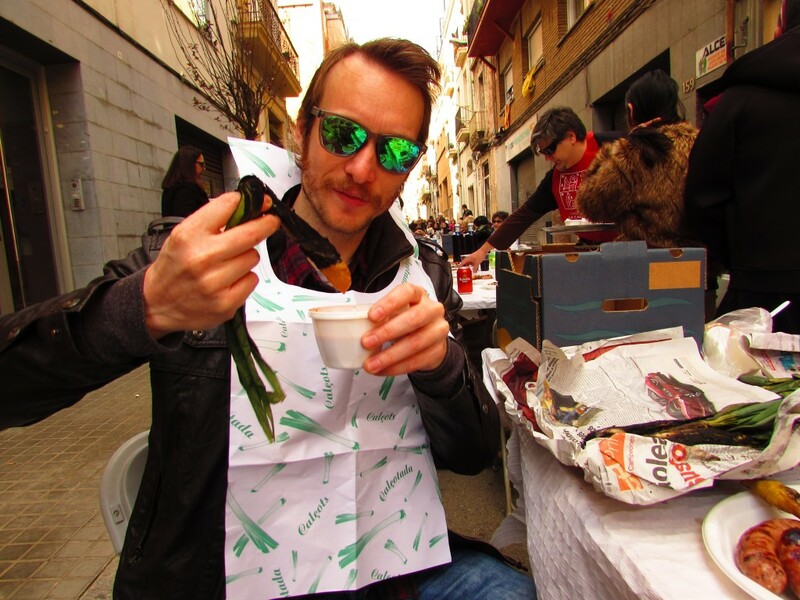 Where to eat it: The biggest “calçotada” parties happen out in the countryside, where rural communities get first pickings, but you will find plenty of street parties throughout Barcelona. 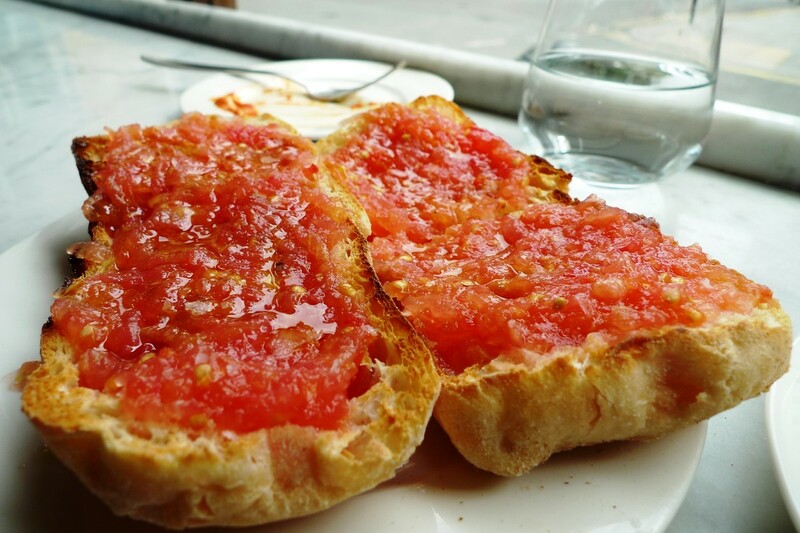 You can also enjoy this rustic ritual at restaurants Quinabarra and L’Antic Forn in the city centre. Highlight: No trip to Barcelona is complete without touching fresh calçot in the famous Boqueria market. Angels & Carmen, Foodie Sisters as the world calls them, offer Boqueria Market Tour & Best Spanish Cooking Class in Barcelona. 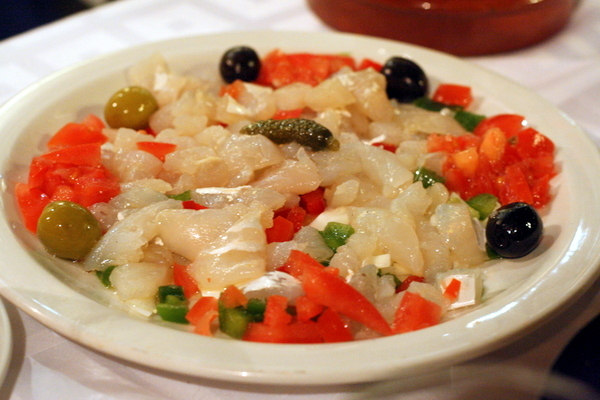 Probably the most authentic Catalan salad you can eat, this light and rustic feast is made with “bacalao” (or raw salted cod) and served with romesco sauce, tomatoes, onions, and black olives. It’s fresh and zesty, perfect with a glass of sparkling Catalan Cava! Where to eat it: The old-world restaurant La Vinateria del Call (which is said to be the oldest wine bar in Barcelona) is the perfect place to discover this good old fashioned local dish. It’s true what they say: “The simple things are always the best.” And it’s especially true in this case. Translated literally as “bread with tomato,” this is an essential dish that can be enjoyed as an accompaniment with every meal from breakfast to lunch and dinner. It’s basically bread-rubbed with garlic and the juice of a tomato and seasoned with olive oil, salt, and pepper. Some places even serve the ingredients separately so you can make it yourself. Stack it with cheese and/or slices of meat, and you’ll find yourself in foodie heaven in no time. Where to eat it: Everywhere and anywhere that you eat tapas! If you go to a restaurant and they don’t have it, you’re not in a good restaurant. Like so many of Spain’s iconic dishes, escalivada is all about showcasing the quality of each ingredient. 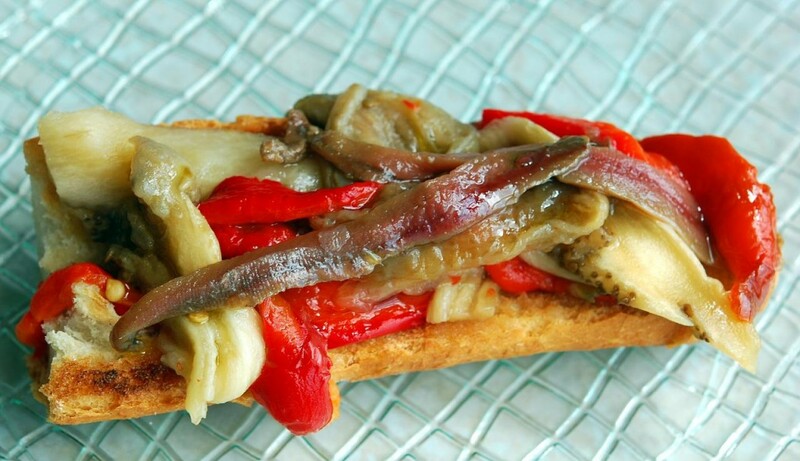 It’s made simply by grilling eggplant and red peppers over an open wood fire and serving them on toasted bread with lashings of quality olive oil, garlic, salt – and if you’re lucky, anchovies. It’s simple, but spectacularly delicious. Where to eat it: Pop into Sésamo in the ever trendy Sant Antoni neighbourhood and you’ll soon understand why the locals love this ancient dish so much. France may be the most famous country in Europe when it comes to cheese, but with its quantity, quality and diversity, there’s no denying that Spain is a close contender. And in Barcelona, or anywhere else in Catalonia for that matter, the one cheese you simply must try is mató. 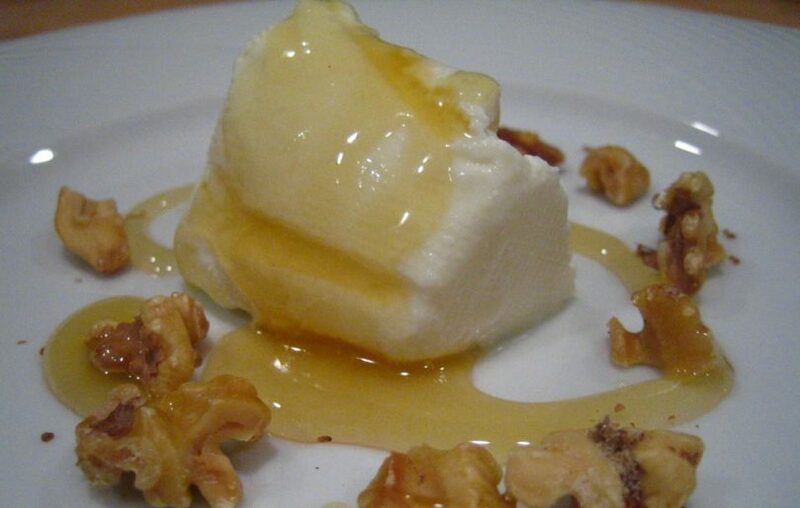 Soft, sweet, and spreadable (a lot like ricotta), the Catalans eat this unsalted goats cheese with honey and walnuts – the perfect regional dessert! Where to eat it: Anywhere that offers it is good, but for a taste tour of Catalonia’s finest cheeses, pop into the Formatgeria la Seu and speak to Katherine, a Scottish lady with an immense knowledge of Catalonia’s many options. In fact, it’s basically the same thing – the Catalans will tell you they created first, the French argue that they did. Either way, once you crack open the crunchy top layer with your spoon, you’re sure to fall in love! Where to eat it: All Spanish/Catalan restaurants will offer it as a standard dish, but at Pastisseria Escribà they serve it over waffles to make it doubly decadent! 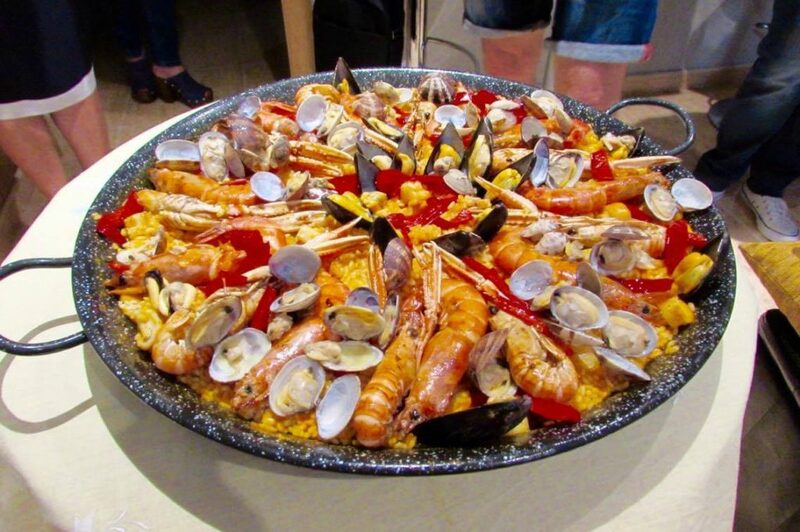 You can always try delicious tapas and seafood paella with a professional Spanish chef, attend a Spanish cooking class together with a Boqueria market tour, or have Paella over lunch.